I was recently at a customer site where they were using a Microsoft Excel based BI Tool, Power View for in house adhoc BI reporting and I was quite impressed. The ease, simplicity and functionality was quite refreshing and I started to do some additional digging into the application and its functionality. My first and unfortunately, my biggest shock, came at the fact it required Silverlight. Yes, you read that right … this means that the reports/functionality is not available on your favorite mobile device. This did not deter me and I was interested on how this could apply to the SAP world from a desktop perspective and was pleasantly surprised when I started scratching the surface. 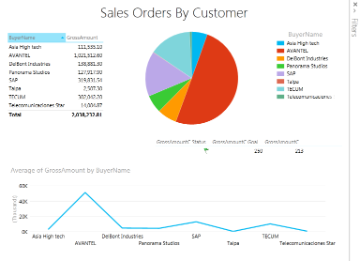 Firstly, a bit of an introduction: Power View is a relatively new product from the Microsoft BI Stack and was recently included in Excel 2013 (Professional Plus editions). It was previously available in Sharepoint Server 2010 and still is included with SP 2013. You can use Power View directly from a Excel workbook, within Sharepoint, as well as deploy the Power View Excel sheet to a Sharepoint 2013 Server. Power View is an interactive data exploration, visualization, and presentation experience (and can be compared to SAP Lumira). When I started to do some digging I found that this blog around SAP MII tool also uses it as part of its data analysis options. Power View has a variety of functions which are covered on this site and I will not repeat. A powerful feature of Excel, which is often overlooked, is the fact that you can use OData as a data source and this allows us to use data from REST based services built using SAP Netweaver Gateway. Since Gateway can subsequently expose data from sources like BW, HANA, CRM, ERP and so on, it provides a great reusable foundation for casual BI, mobile devices or web apps (like Fiori) for lightweight consumption. SAP Lumira also offers OData support with its recent v1 SP11 service pack which now makes it a bit more appealing for customers who have implemented Gateway. What does this mean for SAP customers? With Excel being widely adopted, why not reuse your existing investments and services from Netweaver Gateway to power some casual adhoc BI tools for your business? Data Source: As mentioned previously we can use a OData service as a source for our Power View, in this case we will use a great new service recently developed by Andre Fischer and available on the Gateway demo servers. If you would like to develop your own Power View Sheets based on these demo services, you will need an account. (Its quick and easy!). You can kick things off by selecting a few columns from the sales order collections table which will show up on your report in a tabular format. Next we will clone this table and use it for a Pie Chart, select the table, copy and paste it. Then with the new table selected, click the “Design” tab -> “Other Chart” and Pie. As I am sure you have noticed by now, is that filtering on charts is easy and they are all linked. Selecting a specific customer will actually change all three of our charts appropriately which is very slick. Next we will be adding a KPI, this can be done by heading back to our PowerPivot sheet, selecting a column and selecting AutoSum -> Count. Your KPI base field should be selected and you can define a Absolute Value (“Goal”) of 250 and any other options you may prefer. Select OK. This will convert your calculated column to a KPI, and selecting one of the fields will add it to your Sheet. Lastly what we will be doing is adding a few filters to our view, this way we can filter all charts/KPIs with a single selection. You can do this by selecting “View” on the filter sidebar, then dragging and dropping your needed columns. -> Remember that the dataset is stored in your file. If you made it this and are still engaged I am curious to know if you are using Excel Power View in your organization? What do you think of it? Would you consider using it in the future?